We've given you our guess of what the 2009 Nissan 370Z will look like and, according to the first official photos below, we were fairly close. The vehicle is clearly more shapely with a more aggressive nose than the current Nissan 350Z. You'll also notice a little wedge on the C-pillar. Is that a Hoffmeister Kink? More details at the LA Auto Show, in the meantime you can enjoy the official photos and press release below. Nissan offers the first look at the upcoming 2009 370Z Coupe, which makes its world debut at the Los Angeles Auto Show on 19 November. The all-new 2009 Nissan 370Z, the first full redesign of the iconic Nissan Z since its reintroduction as a 2003 model, solidifies the strengths of its predecessor with an unmatched balance of performance, style and value. 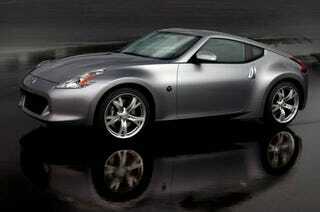 The all-new Z will go on sale at Nissan dealers in early 2009.